A small bowl of kimchi salad improves my mood and makes me feel incredibly good and full of energy. Every. Single. Time. It is loaded with probiotics and prebiotics that benefit the digestive system, balance the hormones and positively impact the brain and thus the state of mind via the mind-gut connection. Kimchi in general and this feel good kimchi salad in particular are part of our weekly detox/health boost routine. Chris and I consider kimchi to be a must eat for everyone without exception. One of many must eats really, but I will share more of our go to probiotic and prebiotic rich recipes in future posts. Consuming these foods is what allows us to ‘afford’ the pleasures of the craft beering lifestyle. In case you are not completely convinced of the importance of a diversified microbiome for both your physical and mental health, please, please refresh your knowledge of the key terms related to the mind-gut connection with this post and consider reading the books referenced in it. Also, read on to learn about two unexpected benefits of kimchi that you will surely appreciate. I fully understand that for many kimchi is an acquired taste. To make the fermented cabbage more appealing I have added a few sprightly flavors and crunchy textures. I promise that this is an actual kimchi salad, not just a bowl of kimchi:) We love it! Salty, sour, sweet and spicy all in one. The combination is both tasty and refreshing. I use julienned green apple, thin slices of lightly pickled English cucumber and daikon radish (home made), a lot of smoked paprika, toasted sesame seeds and sesame oil. Sometimes we make our own kimchi, but we eat so much of it that I usually buy it at Sprouts or as of recently Trader Joe’s. The pickled thinly sliced cucumber and daikon take no time at all to prepare at home and are delicious on their own. It takes exactly five minutes to make a jar of each that can be refrigerated for a few days. I am dead serious when I say that you all should be eating kimchi salad day in and day out. The research results on the multitude of benefits and vital functions of the microorganisms comprising the human microbiome are growing exponentially. What really stands out to me the most (I’m completely fascinated by this connection) is how the diversity and health of the microbiome affects our moods and perceptions of life. Judging by how great this kimchi salad makes me feel shortly after I have it, the good bacteria in it must be abundant. Even if you don’t drink beer/wine/other alcohol every single day (we don’t for two or three days of every week) or enjoy carbs, grain products, non-organic meat or processed foods you need a daily boost of probiotics and prebiotics to keep your gut, body and brain healthy. Did I mention that two of the probiotics in kimchi have been shown to help maintain a slim figure? They are strains of my favorite bacteria genus, lactobacillus. It has the powers to makes kefir, yogurt and sour beers by fermenting sugars and producing lactic acid. Lactobacillus gasseri and lactobacillus rhamnosus are two strains associated with long term weight loss and weight control((http://www.sciencedirect.com/science/article/pii/S088240101200110lipidworld.biomedcentral.com/…/s12944-015-0019-06)), ((https://lipidworld.biomedcentral.com/articles/10.1186/s12944-015-0019-0)). How is that for a reason to eat kimchi salad? Especially if you like craft beer and food as much as we do. Cabbage, cucumbers, daikon and apples are all great sources of soluble fiber (i.e. prebiotics) so this salad also provides plenty of fermentable material for the probiotic bacteria to feed on. Lactobacillus strains are extremely effective against the after-effects of alcohol consumption. Imagine the misery of hangovers gone before it gets a chance to really kick in… It is totally doable, I can vouch for it. It is beyond tried and true. Many times, more than I can count, from my youth days to this very day I have experienced amazing relief of or no hangover symptoms at all by simply consuming probiotics. Typically I’d have kefir or plain, cultured in the cup yogurt after drinking a few beers, just before going to bed. I have a post coming up that is entirely about that and will share a few very useful tips. When I lived in Germany as a student and shared an apartment with four other international students I picked up a few tips beyond Brazilian Pão de Queijo being an excellent pairing to German beer. (We were such a fabulous team:) Our Korean friend clued us in on the magic of Haejang-guk, kimchi hangover soup. It performs veritable miracles when it comes to alleviating hangovers. Just as kimchi eaten straight out of the jar does too. One reason for this are the anti-inflammatory properties of cayenne. The other one, as I am sure you have guessed is the probiotics that fermented the kimchi. Lactobacillus to the rescue! The secrets of traditional hangover foods are being demystified by science. Lactobacillus was recently found to be effective in metabolizing acetaldehyde. Acetaldehyde is the toxin that causes inflammation in the human body post alcohol consumption. This inflammation is at the root of all the hangover discomfort and pains((https://www.ncbi.nlm.nih.gov/pubmed/11093962)). Therefore having a lot of good bacteria capable of eliminating acetaldehyde is very, very desirable after a few beers. With acetaldehyde defeated hangovers simply do not happen. A total win and another huge plus for our craft beering feel good kimchi salad, don’t you think? Kimchi salad with fresh green apple, lightly pickled daikon radish and cucumber, smoked paprika and sesame seeds. Probiotic and prebiotic rich. Sweet, salty, sour and hot all in one. Prepare the pickled cucumber and daikon radish in advance and store in refrigerator. Heat water over medium heat and once it begins to simmer, remove from heat and add salt and sugar. Stir until dissolved and add rice vinegar. Let cool off. Using a mandolin (or spiralizer) thinly slice cucumber and daikon and place in appropriately sized mason jar. Pour cooled pickling liquid, close lid and refrigerate.Let sit for 12-24 hours before using. To assemble salad cut kimchi in small pieces, add julienned apple, pickled cucumber and daikon, sesame seeds, paprika and salt and mix well. Let sit for a few minutes for the flavors to blend with each other. Drizzle with sesame oil (sparingly, a little bit goes a long way) and serve. Are we sistas from anotha mista? Because we eat the SAME THINGS!!! I adore kimchi and eat it almost every day. There’s a huge Korean market right outside of Boston that I visit once a month to buy a 7 pound bucket of their all-natural kimchi. They literally have a wall of all different kinds of kimchi and it’s so fabulous that I can’t even explain the excitement I feel every time I go there. I used to make kimchi at home but now just buy it there BUT I’ll have to try your recipe because want to know what the smoked paprika is like in it. I am so jealous Karrie about that Korean market you describe! Bet it’s nice to be able to buy a bucket of kimchi and have choices. I’ve heard of one in Denver, we are yet to visit. Maybe next week! You will love the smoked paprika I promise. It is perfect with the rest of the flavors. I love kimchi! This chilled salad is perfect for summer! I hope she does like it! It has so many layers of flavor. Thank you Jennifer! This salad looks awesome! 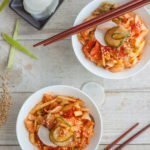 I’m a huge kimchi fan and love how good it is for us! I definitely have to try this. Have a great weekend, Milena! Thanks Kelsie! Hope you enjoy your weekend too!